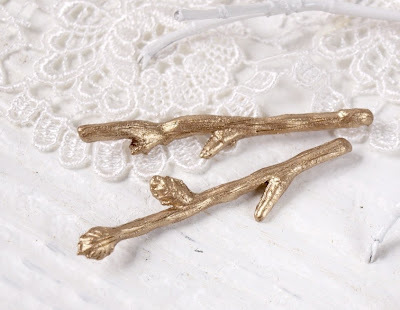 ORDINARY MOMMY DESIGN: Tiny Twigs for My Hair. Tiny Twigs for My Hair. A pair of these hair pins arrived in my mailbox this week. I'm totally in love! So lightweight and super comfortable, they can easily be worn all day; if I didn't feel so pretty, I'd forget they were even in my hair. Bedtime brings a little sadness now, however, because I have to take them off and put them back in their darling little box. Be sure to visit Woodland Belle to see Mai's full line of loveliness! Oh I've been eyeing those pins for awhile now! They are so pretty!